As the summer weather rolls on, so do concerns over people leaving their pets in hot cars. The BC SPCA has already received hundreds of calls about dogs in distress in hot cars. 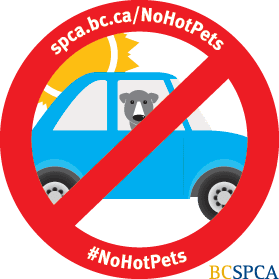 Take our pledge to never leave a pet in a hot car and we will mail you a #NoHotPets sticker so you can show your support and help spread the word. Note the license plate, vehicle colour, make and model and ask managers of nearby businesses to page the owner to return to their vehicle immediately. While most people mean well when they say they’d be willing to break a glass window to get an animal out of a roasting vehicle, it’s strongly recommended you don’t.